Имате въпрос към Sawan Resort? Разположен в Плаж Sunset, Sawan Resort е перфектно място да почувствате духа на Ко Липе и околностите. Хотелът не е далеч от центъра на града - намира се само на 62 km от него, а до летището се стига за около 180 минути. С удобното си местоположение хотелът предлага лесен достъп до всички градски забележителности, които задължително трябва да се видят. Sawan Resort също така предлага много съоръжения за обогатяване на Вашия престой в Ко Липе. Този хотел предлага множество удобства, за да задоволи и най-изискания вкус. Насладете се на висококачествените удобства по време на престоя си тук. В някои стаи са на разположение телевизор с плосък екран, достъп до интернет (безжичен), безжичен интернет достъп (безплатен), стаи за непушачи, климатик, които ще помогнат на гостите да релаксират след дългия ден. Хотелът разполага с голямо разнообразие от развлекателни съоръжения като частен плаж, спа с гореща изворна вода, риболов, масаж, солариум. Насладете се на несравнимото качество на услугите и престижното местоположение на Sawan Resort. The hotel is located on the hillside and it might not be suitable for the elderly. Our mini honeymoon was made unforgettable with the wonderful service and unbeatable sea views at Sawan. Insects aplenty no doubt due to the rustic surroundings, but that was just a mere stain on this wonderful holiday. Was a little pricey but for the privacy and surroundings i think it may be worth it. Our stay was okay but we were surprised to discover that Agoda rates were actually much higher than the actual hotel rates. I am a long time user of Agoda so I didn't properly check actual hotel rates on their website beforehand. I trust Agoda's pricing is always better or at least in line with hotel rates. This was definitely not the case for this booking, and rates of Agoda for this particular hotel were in our opinion overrated. So all in all a disappointing experience. I've been to a lot of resorts in Thailand and other countries and Sawan resort was the best ocean-side resort that I've ever stayed at. The staff were exceptional. They met me at the dock, provided excellent service throughout my stay. I will definitely stay there again on my next trip to Koh Lipe. very good since a little far away from the centre. as a new hotel and you can find very few comments, we fortunately choosed it and a beautiful memory for my family.totaly they have 5 individual rooms, and with very good sea view. easily to get to their own beach to swim and boating. I will leave for next time and please don't change too much. We went there for our honey moon, great room, great design, clean, complete, great view, romantic. We book the furthest room from the private beach, nearest to the road but its not noisy as Sawan like the only resort nearby (downturn, quite far from the mainstreet makes it almost impossible to walk, but they provide free shuttle). Nice spa & massage place where u can relax while listen and view the sea, small but so so beach infront of the resort, where u can stroll down to the fisherman village along the shore. There are several great local restaurants there. The breakfast option could be better, but the dining area view to the sea is breathtaking. Will visit again for our anniversary, for sure. Stayed in Sawan Resort for 3D2N, room type is Ocean Villa. (1) Icy watermelon juice is served as our welcoming juice, and it really made us feel very refreshing after the long & rough journey to arrive at the island. (2) Reception staffs (Ms. Um and Julie) speak fluently English, where else most of the Thai people on the island doesn't understand English well. (3) All resort staffs we deal with are friendly, very accommodating, helpful and with high efficiency. (4) Resort provides free shuttle to mobile around the island. Resort also ready with snorkeling gears & kayak which is free of charges. Sawan prepared beach tote, beach towels and umbrella for guests with no extra charges. 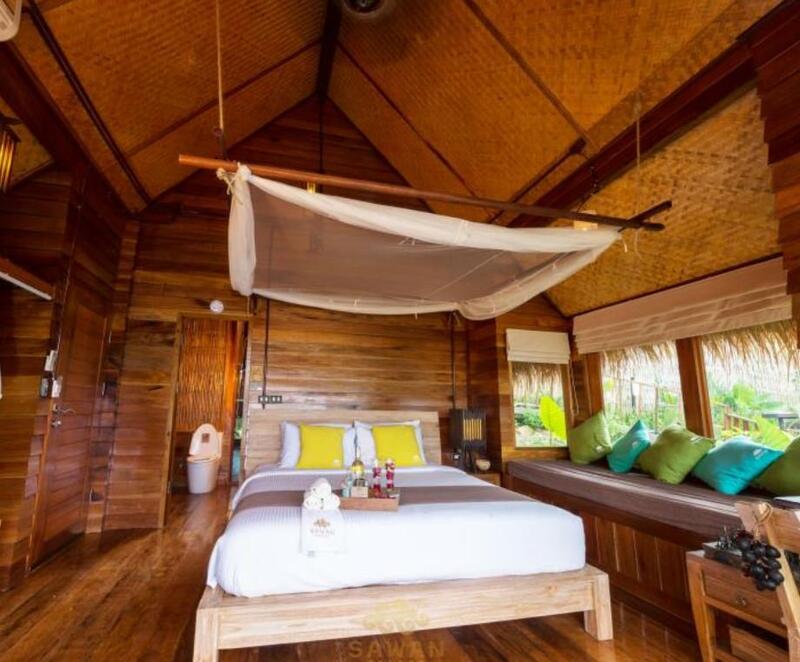 (5) Each resort villa is design to let the guests having own privacy, and ours facing the sea, Attap & wooden villa bring us feeling closer to nature. The only downside we feel is - breakfast is relatively over-simple, limited food choices, portion too little, quality of foods are not on par comparing with other hotels/resorts (sausages, hams, scrambled eggs, toasts, strawberry jams etc). Side note: (1) our thought is the mosquitos issue is unavoidable because the island is mostly surrounded by jungles, other hotels/resorts on the island maybe also facing the same issue. As to relief the annoyance of Mosquitos inside room, Sawan provided 2 mosquito repellents. (2) special thanks to P.Chai for the friendly & attentive help when in need. And we're gratitude also goes to reception staffs Um & Julie for always there for us. We will choose Sawan Resort again when we back to Koh Lipe. We're regret our stays in Sawan was too short. Besides a buch of mosquito and a snack and bird nets on the roof there is No restaurant available. No water activity available even the beach activity such as beach chair and kayak are available. Hotel guest need to take taxi and eat n drinks drinks out. Despite the hotel keeper which is young nice but seems to be lack of experience on hitel manangement. We definitely tell friends that dont believe on the website photo. Big mistake to stay at this place. need more lighting, abit too dark in the washroom and walk way. staff were super helpful and friendly. The beach area (which is much smaller than on the photos) was under construction, bar and deck not useable, only two old dirty chairs to lay on. all the green between the bungalows was cut off and therefore there was only a muddy hill view visible, beside the way down to the beach they dumped all the cut down plants which resulted in a not too nice view of rotten vegetation. The construction on the beach bar facilities meant the whole day loud noise. the pictures on the website do not reflect how the resort is in shape currently, we assume it is linked to the new local management. When we moved out they were somehow upset I assume, so they let me carry all the luggage alone although demanding the full three nights payment. All in all not very professional which is sad since there is big potential for the place.